If you’ve been checking in on social media this week you’ve probably been hearing a lot about the new Vine app that Twitter released recently. As far as social media goes, it seems to have been a fairly polarizing development- a lot of people have been declaring to be adamantly for it or against it. I started off being pretty indifferent to it and was leaning towards not joining at all. I’ve heard from a lot of bloggers that it’s its a good idea to pick 3 social media platforms and be very involved in them, and I still think that’s a good idea. However, around Sunday afternoon I was getting an itch to see what all the fuss was about- so I caved. And I’m glad that I did- it’s pretty cool to watch the cool things that people come up with! But I do think there are some things about it that are not so great, so I thought I’d share my thoughts with you today. Less stylized. Unlike Instagram, there aren’t a million and one filters for this (yet?) Don’t get me wrong- I love the artistic and styled aspect of Instagram. But something about Vine feels more real and less staged, which I think is a cool opportunity for authenticity. Quick way to put yourself out there. Your personality really shines through more in a video than a picture. I’m looking forward to making videos that are funny- or at least show that my sense of humor often involves weird noises and silly faces. You might not know that from reading my blog. Captures space well. Sometimes it’s hard to really get the feel for a space in a photograph- particularly small spaces. Vine is pretty cool because by virtue of motion it allows you to show more, quicker. My mom is a realtor and I’m totally signing her up for this- I think that it would be really cool to show little snippets of listings. It would really help you get a feel for a space quickly. Babies and puppies are even cuter in motion. This is just a fact. Weird username interface. Because it’s compatible with Twitter, you’d think that you’d be able to use Twitter handles to tag people or at least find them. Not the case. Even though I used my Twitter account to sign up, to find me you have to search “Kate Baird.” It’s annoying, especially if you want to tag someone in your post. Only accessible via iPhone. For some reason they didn’t take the cue from Instagram and make profiles accessible from the web, which makes it tricky to share your profile across other platforms. And of course- this is iOS exclusive for now, so you’re left out unless you have an iPhone. Sound. This can obviously be a good thing too, but sometimes when you’re scrolling through it gets really annoying to hear someone say the exact same thing over and over again every six seconds. Be aware of how you sound when you’re filming, and remember that less is more when it comes to talking on Vine. More time sensitive. I like that you can take a picture and upload it on Instagram whenever you want. This doesn’t seem to be the case with Vine. Can get boring quickly. Because there aren’t any filter options, sometimes the everyday things that would seem artistic on Instagram can just be plain boring after a while on Vine. And like any social network it’s easy to want to post but not have anything to show (trust me- I’ve taken like 8 of them and only posted 1 so far!) My strategy is to post sparingly. Are you on Vine? What do you think about it? And if you have any favorite people to follow, let me know in the comments! Another con I’ve noticed is that links aren’t clickable…like our blog links in our profiles and any links we add to the caption…which means promoting our brands to a new reach is kind of impossible through vine. Yeah, that’s true- are they clickable on Instagram? Not like IG is 100% perfect or anything. I do think that you can promote your brand without them having to necessarily click on anything though, just because I think there is value to people getting to see more of your personality even if they aren’t led directly to your site. I’m kind of a purist when it comes to that on Instagram- I get a little annoyed when others post screenshots of their posts. But I think that’s just a personal preference! 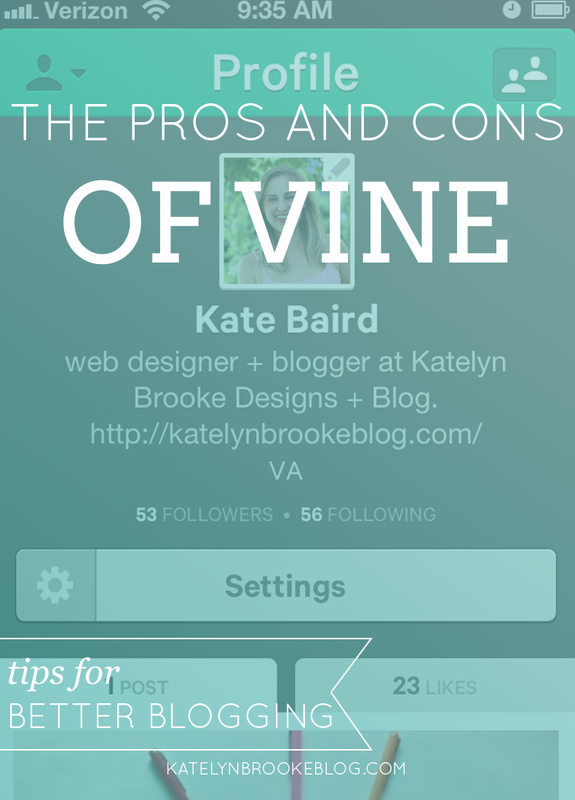 I’m so glad to know I’m not the only one who noticed a few cons of Vine right off the bat. I joined, but let’s face it, I like the “instant” gratification of Instagram. Vine is a bit more time consuming & the UI needs some tweaking. Not sure I’m fully onboard yet. Glad you jumped on this one Kate – THANK YOU! I was hesitant at first, but now that I’ve joined, I’m kind of obsessed with checking out people’s Vines. I’ve yet to actually make one myself. Seems like it takes too much work. I love the creativity I’ve seen so far though. And I HATE the face that there are no usernames. I don’t even know what they were thinking. One of my favorite people to follow is Sarah Vickers. I seriously kept watching the shoe one she posted yesterday. Isn’t it fun? And I totally agree about the usernames. Thanks for the rec- I’ll have to check her out! I totally agree with both pros and cons you listed! The tagging thing in comments and captions is a bit of a bummer. It is only their first release – so fingers crossed that it will improve over time. It wasn’t until pretty recently that Instagram allowed you to access your portfolio of photos online, so I’m guessing its in the scope for the next year. (total conjecture, but one can hope!). And thanks for the shoutout. :) I’m glad you like my illustration videos! They are super fun to make! Right now, I’m not a fan (except for puppy videos, obviously). I think this is definitely a social media platform where curation is key, and since it’s so new, people aren’t there yet and are just posting crap for the sake of playing with it. I think you really have to ask yourself if motion adds anything to the scene, otherwise it should just be Instagramed, because I’m seeing a lot of things that I really didn’t understand the point of videoing. The best uses I’ve seen so far are the people who actually talk to the camera (though, I think you should still limit how much you do this, because after a while it just looks like you’re obsessed with yourself), and to show a series of images where you’re setting the whole scene, but multiple Instagrams would be overkill (can’t handle the shakiness of it though — hopefully in the future they’ll allow you to turn photos into slideshow-type videos to avoid that). Personally, I don’t want it to take my focus away from the social media platforms I do enjoy and am good with, so if I use it, it will be for personal reasons only — a moment from a vacation I want to remember, that sort of thing. I totally agree that it should be used with some thought and intention behind it. And as someone who gets annoyed when my IG feed gets flooded with pictures of the same thing, I definitely love that use for it! And hopefully they can maybe figure out a way to get the shakiness factor down- it is a little ridiculous at times. i second lisa’s entire comment. there are some people who have this in the bag and their personality and brand completely shine, but for the majority, it’s hard to make a six second video of ordinary things in everyday life look interesting/artistic. it is a fun new platform to browse through, but i will probably not be using it on a daily basis as i do with my other social media. I’ve noticed that too- it seems like some people were born for Vine! But I definitely agree- I posted 3 days ago and I haven’t figured out what will be “worthy” of posting next! I saw you posted about it this a few days ago and thought I’d try it. For now, while Vine is still a new thing I think the GIFs are a little unnatural looking. But, I’ll figure out eventually. When I see ANOTHER social media platform emerging, I want to crawl onto the couch with my giant blankie and bury my head under a pillow. I simply cannot keep up with it all. It exhausts me. I like the idea of it, but I’m at a point where I’m not 100% sure what to do with it. Someone I saw on Twitter put it best – I don’t have a baby or a dog, so now what? Mostly I grabbed it because I wanted to make sure I got my username since there are so many Kate Sullivans out there. I would love to see an improved version of this – maybe one where I could use videos I didn’t shoot in the app? The Viddy app let me do that and add filters but no one seemed to jump on that bandwagon so I just kind of walked away from it. I also notice my uploads fail pretty often, which is just frustrating. Like I said, I like the idea of it but right now I’m just not sure. But Kate- you have TWO DOGS! Haha I really liked the video of your puppies watching the bacon the other day :) I had that happen to me once too, and it was really annoying! I like that on Instagram if it’s not working you can always post later, but on Vine it feels very now or never… hopefully they’ll fix that! It’s almost as tho twitter pushed this thru well before they were ready to launch with so many fails and glitches and pretty obvious UX/UI flaws. I’ve been playing around with it (when it works) and will admit to deleting more vines than I’ve posted. A couple ‘cons’ I’d add to your list is that what you create isn’t added to your camera roll and there’s no easy way to embed/upload a video for the novice blogger. a group here in Boston created a very cool app (not sure if it’s available for android, too) called http://directr.co/ You can curate your clips and add words as it happens – I like the option to save and come back when time allows. Disclaimer: I haven’t made a video yet because it was a little daunting but after working with Vine for the last week or so I think I’ll give this a try. You are on it chick. My biggest complaint has been that my videos aren’t loading, so I spend a couple of minutes trying to create a cute video only to receive a black screen. As a result I’ve kind of avoided the app since about day two. I want to use it and enjoy the less censored world of bloggers I enjoy, but I’m not going to spend my time trying to create something worth sharing, only to have it disappear. At least with twitter and instagram my efforts are evident. That’s the worstttt! Especially since it does take some serious thought to make a video, and a lot of times you’re capturing something that you can’t do again. I hope they figure out a way to fix that soon!